Today is a special day here at The Converse Blog. 24 years ago today on 4-4-84 my Mother almost pulled my Father's ear off and I was born. So today to give myself a birthday gift, I will be featuring my favorite basketball team of all time. I am not sure what attracted me to the Charlotte Hornets. The team colors perhaps? Most likely it was Larry "Grandmama" Johnson, Alonzo Morning, Muggsy Bogues, and Dell Curry to name a few. Whatever the reason I was stung by the team from Charlotte. The last few years of the team's existence in Charlotte we would travel to a home game close to my birthday. I've been to a few Bobcats games, but it's just not the same. So my birthday gift...to myself?.... 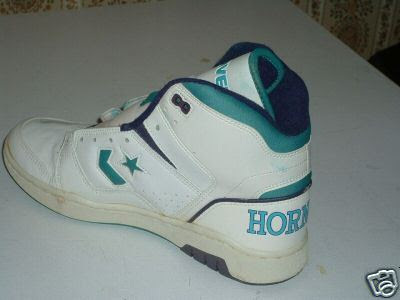 today is the Converse NBA Charlotte Hornets. That wasn't the real name, but you get the picture. 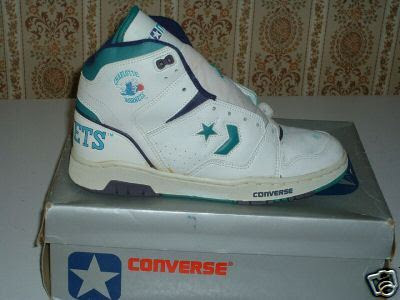 Long before Adidas was the official supplier of NBA gear, which grants them rights to use NBA logos on footwear, Converse did the same. Part of being the Official shoe the NBA meant that they could use NBA teams logos and they did. They actually made performance shoes with the teams logos and not just casual shoes like Reebok and Adidas have made recently. 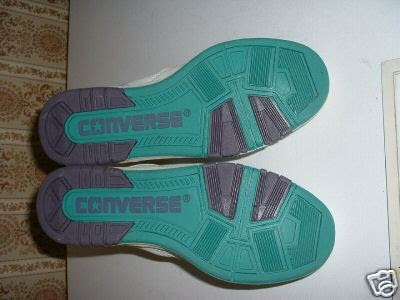 Teal and Purple, it doesn't get any better than that, True Story. 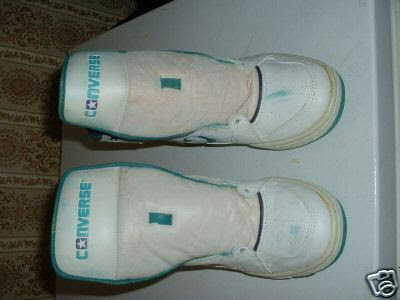 Thank you all for coming to the Converse Blog. There are only a few days left in the poll and I totally thought Kentucky would win, but it doesn't look that way. Keep voting though anything could happen. remember when a lot of teams were switching their colors to get teal in their unis (pistons). soooo lame!